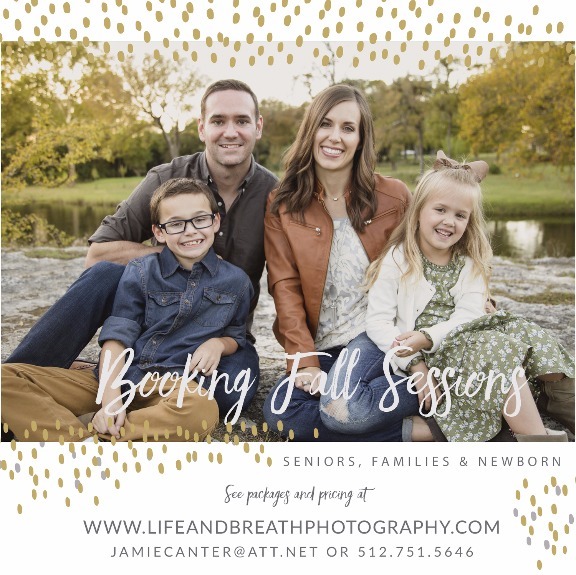 Life and Breath Photography - Booking Fall Sessions! With the arrival of Fall comes so many fun things: the temperatures start to cool down, new Fall clothes, Friday night football, Fall decorations, and of course, Family photos! In Texas, we still have plenty of beautiful foliage for great backdrops for family and milestone photos. And this year's rainfall means it will be green even longer! Each year our business has grown and we are booking up faster now than ever. We would love to get to capture your family's special moments and one of our great locations. Contact us now!